What is My Music Staff? 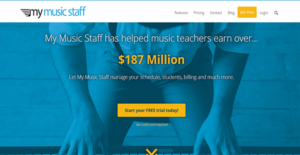 My Music Staff is a web-based music studio and lessons management software that lets you manage unlimited students from any device anytime. With its easy monthly pricing, you do not have to worry about rising costs whenever you add a new student to your list. On top of that, there is only a minimal fee per additional teacher per month. Aside from its budget-friendly pricing, what makes My Music Staff a great companion for music studios is its comprehensive list of features. It allows you to schedule lessons and send email or SMS reminders to students and teachers alike. As such, you can minimize losses due to no-shows by either party. Moreover, My Music Staff has a feature-rich billing management window. This lets you bill students or their parents automatically according to your calendar. On top of that, your professional-looking invoices have an online payment feature enables secure transactions over the web. As such, you can track payments and balances seamlessly from a single interface. My Music Staff charges a flat rate per month that activates its full suite of features. Because of this, even as your enrollment increases month-to-month, your software fees stay the same. And although you have additional teachers in your studio, the fee to create an account for each of them is minimal. Plus, this lets them utilize all of the available tools in the solution as well. Even if you teach at different locations for every lesson, you can be sure that My Music Staff has the tool to help you manage it. The web-based software has a powerful timeline view that can organize even the most hectic teaching schedule. From there, you can create new lessons, modify time slots, or add new events like group sessions. With this online solution, you do not have to worry about either student or teacher missing a class. That is because it automatically synchronizes changes made to the calendar across the organization. Finances are the most arduous thing to tackle in any organization. But with My Music Staff, you can automate several related tasks so you can focus on your lessons instead. The cloud program has a flexible billing feature that lets you send invoices according to your calendar on a weekly, monthly, or annual basis. You can even send out bills bi-weekly or every custom semester. More than that, you can provide an auto-payment option to your clients. This lets you store their credit card or bank account information securely so can receive payment from them automatically. The solution even handles the data entry for this, thus letting you save more time. A strong online presence can help you gain more students. That is something the creators of My Music Staff understand, which is why they have included a website and blog management suite with the solution. This lets you customize your online front and student portal with your logos and colors for consistent user experience. Additionally, your music studio’s website and blog have social sharing options that help spread the word about your musical and teaching talents. Every company has its own characteristics, and may need a special Learning Management System - LMS solution that will be fit for their business size, type of clients and employees and even specific niche they cater to. We advise you don't count on getting a perfect solution that will work for every company no matter what their background is. It may be a good idea to read a few My Music Staff reviews first and even then you should remember what the software is supposed to do for your business and your employees. Do you require a simple and intuitive service with only elementary features? Will you actually use the advanced functionalities required by pros and large enterprises? Are there any particular features that are especially practical for the industry you operate in? If you ask yourself these questions it is going to be much easier to get a trustworthy service that will fit your budget. How Much Does My Music Staff Cost? My Music Staff has a simple enterprise pricing. They charge only $12.95 per month and this lets you use the entire suite of features. If you have colleagues, you can give them access for $3.95 per month per teacher. You can add or remove coaching accounts as well as rollback to the single instructor plan anytime. We realize that when you make a decision to buy Learning Management System - LMS it’s important not only to see how experts evaluate it in their reviews, but also to find out if the real people and companies that buy it are actually satisfied with the product. That’s why we’ve created our behavior-based Customer Satisfaction Algorithm™ that gathers customer reviews, comments and My Music Staff reviews across a wide range of social media sites. The data is then presented in an easy to digest form showing how many people had positive and negative experience with My Music Staff. With that information at hand you should be equipped to make an informed buying decision that you won’t regret. What are My Music Staff pricing details? What integrations are available for My Music Staff? If you need more information about My Music Staff or you simply have a question let us know what you need and we’ll forward your request directly to the vendor.